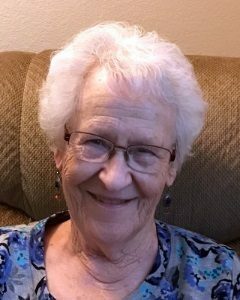 Virginia “Ginny” Weis, age 91, of Phoenix, Arizona, formerly of Glencoe, Minnesota, passed away Sunday, February 3, 2019. Mass of Christian Burial will be held Saturday, March 9, 2019, at 11:00 A.M. at St. Boniface Catholic Church in Stewart, Minnesota, with interment in the church cemetery. Gathering of Family and Friends will be Friday, March 8, from 4:00 – 7:00 P.M. at the Dobratz-Hantge Funeral Chapel in Hutchinson, Minnesota. The Rosary will be prayed at 4:00 P.M., with the Prayer Service at 6:30 P.M. Visitation will continue on Saturday at St. Boniface Catholic Church at 10:00 A.M., for one hour prior to the service. Memorials preferred to Hospice of the Valley, Ostomy Support Group East Valley Arizona, or the charity of your choice. Virginia May Weis was born on May 1, 1927, in Stewart, McLeod County, Minnesota, the daughter of Henry and Grace (McGraw) Maiers. She was baptized and confirmed in her faith at St. Boniface Catholic Church in Stewart. Virginia, affectionately known to her family and friends as Ginny, grew up in Stewart, and graduated with the Class of 1946 from the Stewart Public High School. She continued her education at St. Mary’s X-ray School, completing her studies in 1949. On November 11, 1950, Virginia was united in marriage to James “Jim” Weis by Father Stolz at St. Boniface Catholic Church in Stewart. They first lived in Stewart, and moved to Glencoe in 1955 where they raised their five children. They established and operated Weis Upholstery in 1950, and retired their business in 1992. Throughout those years, Ginny worked as an x-ray technician at the Glencoe and Hutchinson Clinics, and retired in 1995. Ginny and Jim then spent winters in Arizona until they moved to the Southwest full time in 2003. On Sunday, February 3, 2019, Ginny passed away at her home at Mountain Park Senior Living in Phoenix, Arizona. Blessed be her memory. Virginia was preceded in death by her Parents, Henry and Grace Maiers; Husband, James F. Weis, Son, James P. Weis, Siblings: Sister Mary Jean Maiers OSJ, Daniel Maiers, Paul Maiers (Margaret), Joe Maiers, (Rita and Sally), Jack Maiers (Dotty), Loy Maiers (Lucille), Stan Maiers, Ray Maiers (Dolly), Brenda Maiers, Pat Maiers, Maureen Rubishcko; Brother-in-law, George Kuttner; Parents-in-law, Herman and Anna Weis; Sisters-in-law, Marie Hill (Frances) and Louise Kielblock. Ginny, you were a wonderful Aunt and will be greatly missed. Love and hugs to Patty, Bill, Mary, Kathy and their families and to Ginny’s remaining Maiers siblings. Deepest of sympathies-Many prays-Hugs and kisses for you all! I am so sorry to hear about your dear mom. A number of years ago I broke my leg and we always had such nice conversations when I would come in for a x-ray. She was so kind and caring. Herman Weis supplied me with all my sling shot leathers,and i remember all the Maiers that came thru Larson Hardware in Stewart. I remember Jim and Ginny while we lived in Glencoe. All good folks,God bless them all. Dear Family, I’m so sorry to hear of the loss of your loved one. My sincere condolences to you. May you think of the many beautiful memories that you shared with Virginia, and cherish those precious moments. May the God of all comfort caress your heart with his living promise to one day reunite you together again, in the future paradise mentioned at Revelation 21:4,5. Our Dear Heavenly Father Jehovah (Psalms 83:18) knows the many tears you cry, and He will sustain you, if you let him. I hope that you can find comfort during this difficult time.